"Propontis" redirects here. For the Liberian cargo ship, see SS Propontis. The Sea of Marmara (/ˈmɑːrmərə/; Turkish: Marmara Denizi), also known as the Sea of Marmora or the Marmara Sea, and in the context of classical antiquity as the Propontis is the inland sea, entirely within the borders of Turkey, that connects the Black Sea to the Aegean Sea, thus separating Turkey's Asian and European parts. The Bosphorus strait connects it to the Black Sea and the Dardanelles strait to the Aegean Sea. The former also separates Istanbul into its Asian and European sides. 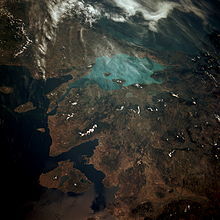 The Sea of Marmara is a small sea with an area of 11,350 km2 (4,380 sq mi), and dimensions 280 km × 80 km (174 mi × 50 mi). Its greatest depth is 1,370 m (4,490 ft). The sea takes its name from Marmara Island, which is rich in sources of marble, from the Greek μάρμαρον (marmaron), "marble". The sea's ancient Greek name Propontis derives from pro- (before) and pontos (sea), deriving from the fact that the Greeks sailed through it to reach the Black Sea, Pontos. In Greek mythology, a storm on Propontis brought the Argonauts back to an island they had left, precipitating a battle where either Jason or Heracles killed King Cyzicus, who mistook them for his Pelasgian enemies. The surface salinity of the sea averages about 22 parts per thousand, which is slightly greater than that of the Black Sea, but only about two-thirds that of most oceans. The water is much more saline at the sea bottom, averaging salinities of around 38 parts per thousand, similar to that of the Mediterranean Sea. This high-density saline water, like that of the Black Sea, does not migrate to the surface. Water from the Susurluk, Biga (Granicus) and Gonen Rivers also reduces the salinity of the sea, though with less influence than on the Black Sea. With little land in Thrace draining southward, almost all of these rivers flow from Anatolia. The sea contains the archipelago of the Prince Islands and Marmara Island, Avşa and Paşalimanı. The south coast of the sea is heavily indented, and includes the Gulf of İzmit (Turkish: İzmit Körfezi), the Gulf of Gemlik (Turkish: Gemlik Körfezi), Gulf of Bandırma (Turkish: Bandırma Körfezi) and the Gulf of Erdek (Turkish: Erdek Körfezi). During a storm on December 29, 1999, the Russian oil tanker Volgoneft broke in two in the Sea of Marmara, and more than 1,500 tonnes of oil were spilled into the water. The North Anatolian Fault, which has triggered many major earthquakes in recent years, such as the August and November 1999 earthquakes in Izmit and Düzce, respectively, runs under the sea. On the West. The Dardanelles limit of the Aegean Sea [A line joining Kum Kale (26°11'E) and Cape Helles]. On the Northeast. A line joining Cape Rumili with Cape Anatoli (41°13'N). ^ "Marmara, Sea of - Dictionary definition of Marmara, Sea of - Encyclopedia.com: FREE online dictionary". www.encyclopedia.com. Retrieved 3 January 2018. ^ Liddell, Henry George; Scott, Robert. "A Greek-English Lexicon". Henry Stuart Jones and Roderick McKenzie. Perseus. Retrieved January 12, 2009. ^ Parada, Carlos. "Greek Mythology Link". Archived from the original on February 13, 2002. Retrieved April 30, 2001. ^ "Limits of Oceans and Seas" (PDF) (3rd ed.). International Hydrographic Organization. 1953. Retrieved February 7, 2010.